Predict the actions of a spectator perfectly! The spectator places transparent plexi sheets on his two selected cards. There is a black circle on the first plexi sheet and there is a black triangle on the other one. 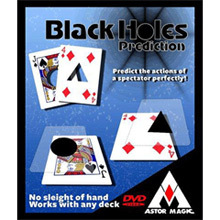 The magician takes out 2 cards from an envelope which was on the table in full view before he started the trick. The cards perfectly match with the spectator's selections. The hole in their center matches wit the geometrical shape on the plexi sheet that was placed on the selected card.